A bright, easy to turn on, light when you need it. Strong key ring attached. Minimum order with your imprint, 150. Quantity variation +/- 5% is possible & billable. Translucent LED Keylight lights up any hard to see lock. Product Size: 3-3/4"w x 15/16"h x 3/16"d.
Product Colors: Black, Blue, Red. 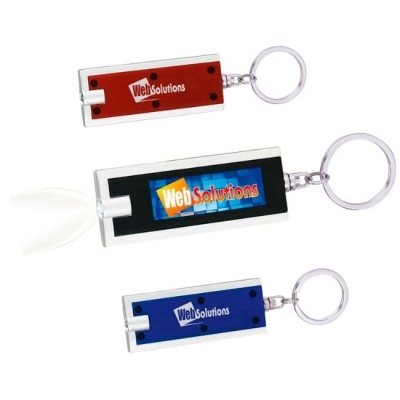 Price Includes: 1-color imprint, 1 location. Screen Print: Front, 1-1/2"w x 7/16"h, 1 color. Optional britePix Full Color Imprint at extra charge. See our instructional video page, "Why People Choose the Rectangle LED Keylight"